I used to work for a maintenance and upgrade company that King’s Island hired for projects their staff couldn’t do. 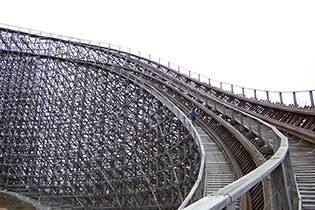 A few years ago we were asked to do some work on the Son of Beast roller coaster, a record-breaking wooden roller coaster that opened in 2000. 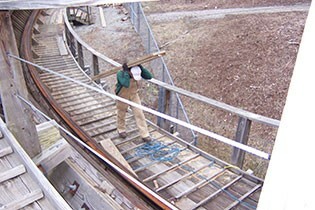 Our job was to fill in any gaps in the wood that came between the catwalk and rail deck on the Son of Beast roller coaster. This was to provide better access for emergency riders walking the catwalk. We set up shop at a low spot where the power resources were located. 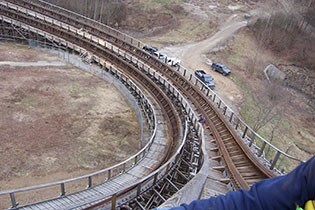 From this spot we could build slats and make cuts to the wood, then we had to walk up the entire Son of Beast to install our pieces. Since we did not have lifts to get us to our work areas, we had to keep hand tools to a minimum and rely on cordless power as the work area was spread out. I kept my 18 volt Bosch Brute Tough drill/driver with me to pre-drill and run screws into the lumber and install materials. 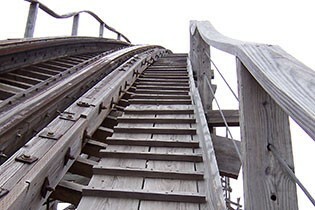 We started working for several days in the lower areas, but then we were told that we needed to focus on the higher areas of Son of Beast. We proceeded to decide how we were going to get our power and materials to the higher areas. I decided to go take a look from the second highest point, where I snapped the Work Hard, Play Hard photo contest winning photo. 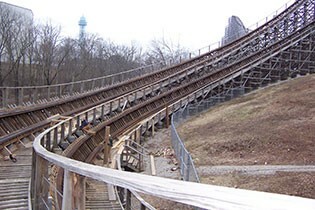 Because of the lack of power on top of the coaster, we had to walk all our materials and tools up and down the Son of Beast multiple times per day. Unfortunately, I wasn’t able to continue working on that project because I was assigned to work on another job. 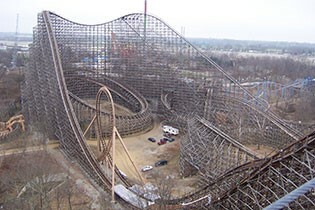 The others did continue to work on the Son of Beast roller coaster, and the work was eventually finished. My favorite part of the job was having the opportunity to experience a famous roller coaster in a way others can only dream of. When installing door closures into metal doors and frames, try to find some fine threaded tek screws to pre-drill your holes, as they have the same thread as the closure screws. This will save from having to drill and tap the same holes. Also remember to place some foam into the head of a masonry door frame, so when the frame is grouted in, your hardware screws and silencers will go in easier. When hanging drywall around door frames, keep a piece of 20 gauge metal track handy to slide the board behind the frame. Written by William Barnes. William is a journeyman carpenter based out of Dayton, OH.